Key holder only systems that are simply telling you the alarm has gone off are being offered by most high profile alarm companies in the UK as their standard alarm system. Some companies are even charging up to £26.99 per month for this service, but does the system provide any real security? You are simply paying to be told that your alarm has gone off after the event. The way the key holder only system works is that when your alarm system is triggered, an alarm monitoring station receives an alert. They will then contact you or your nominated key holders (and usually just with an automated message) to inform you that there has been an activation. It is then your responsibility to return home and secure your property yourself. With a key holder only system you are paying a company to get in contact with your every time your alarm is activated. You are paying for a notification system, not a security system. You may as well just purchase a DIY auto dialling alarm from your local hardware store and program it to send you an automated message every time your alarm triggers. It won’t provide any real security, but at least this way you are avoiding the ongoing monthly charges without out any change in service. · Is this key holder only system providing me with real security? · Do I wish to be called at work, or when I am out socialising, or worst still when I am relaxing on holiday simply to tell me that my alarm has gone off? · Would I rather have a system that confirms if its a real or false alarm and calls the police and a key holder? 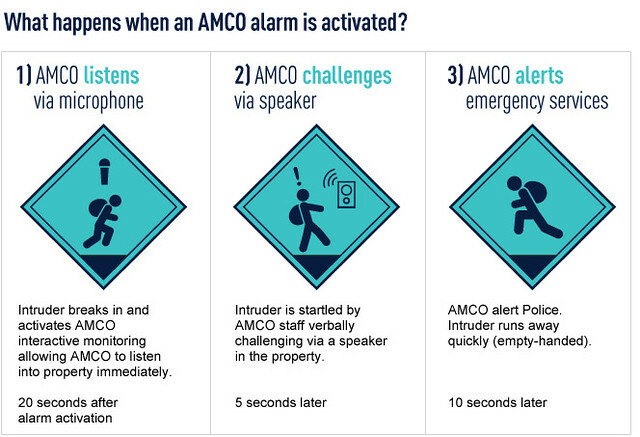 The Alarm Monitoring Company, AMCO, provides real security with immediate live response to all activations. Using our 2-way audio alarm monitoring, we are not only able to listen into the property to detect sounds of intruders, but, over a loudspeaker, we also challenge any intruder who may be on site. Apart from immediately frightening the intruders and deterring them from taking any goods, we can then alert the police and inform the chosen key holder that we have detected an intruder on site. To summarise, if you would simply like to be told that your alarm has gone off – Get it from your local hardware store. Do not pay high monthly costs to a company to simply notify you every time your alarm triggers – especially with police reported false alarm rates at over 90%! If you would like a monitored alarm system which offers real security 24/7 call 0800 1 303 999. Sadly because of the frequency of false alarms most people ignore burglar alarms sounding - so noisy burglar alarms no longer "raise the alarm" and are therefore ineffective. As a result many companies sell systems that telephone the owners when an alarm is activated. (Automatic dialing systems and the infamous ADT £99 system.) These are communication systems that "raise the alarm" to the owner, but then put the owner in the unpleasant situation of being unable to take any immediate remedial action. Before the police will respond, the owner has to have the property checked to see if any damage or loss has been sustained. This allows a burglar plenty of time to steal goods. This makes such systems ineffective. Furthermore, since over 95% of these alarms are false alarms*, they cause needless worry! Audio response monitored alarm systems and on site man guarded monitored alarm systems are the only systems that provide "immediate remedial action" and are effective. Yes you read the headline correctly. Your property is in danger of being compromised by unwanted intruders at any given moment. As you read this gangs of interlopers are outside your property. They are eyeing up the weak and vulnerable spots in your building and they are going to affect a silent and possibly very expensive break in. You may think you have the most up to date security system available to protect you; unfortunately this will not stop this heinous crime from happening. Nothing you have done or try to do will stop them. These invaders into your property have the ability to make over 50% of the population scream in abject terror. The very sight of them can make a fully grown man into a jabbering mess. They may well wake you in the middle of the night or they may just wait until you have got to work and then commit the “crime”. Whatever they do it will not be to your benefit. So what is it that I am referring to? They are from the Araneae family (this is not a gang of thieves from outside the EU). They are air-breathing anthropods, Arachnids. Or to you and me spiders! Now I am not talking bird eating tarantulas here just your common or garden spider. Currently we have one living just outside our kitchen window. Its eight legs span out to about the size of a ten pence piece and it has being doing a wonderful job at keeping the autumnal wasp population down and I am happy to report that it yet to have a go at either of our dogs and has mostly not troubled the postman. However if it gets in to the house my life will become a misery. If I am not spending my time trying to catch it to placate my screaming wife I will be wondering where it is and will it decide to set up its winter retreat anywhere near any of the detection devices that make up our security system. In days gone by spiders could get inside the passive infra-red detector (that is the thing in the corner of the room with the red flashing light) or even in some cases duel technology microwave sensors which are used in environments where small critters may lurk. Once inside they can cover the device that does the detecting thus making it think there is an intruder and triggering the security alarm. Nowadays most detectors are fitted with a piece of plastic to stop this happening. However if the spider decides to playfully swing from its web in front of the detector or if big enough to just blatantly walk over it you are going to have problems. If, like me, you have one of AMCO’s alarms your problems will only be localised. The broken night’s sleep, the hysterical wife etc. If you are away from the property and a spider triggers the burglar alarm our operators are going to be able to hear that there is no criminal activity on site and act accordingly. If your intruder alarm is with another company (see previous blogs) then you problems could be untold. False alarms can mean expensive engineer resets. Multiple false alarms can lead to the withdrawal of police response. If you lose your police response it can lead to the loss of insurance cover. And so on it goes. As a precaution to this impending invasion, a bit of housekeeping never goes amiss. If you can manage to get your vacuum cleaner or duster and clear any cobwebs from around the motion detectors, and if you can do it safely then a bit of fly spray around (not on) the security device. It won’t kill a spider but apparently they are not keen on it and tend to avoid. So there we have it. If you are already an AMCO customer you need to arm yourself with a feather duster and a can of Flit. If you are with a different company you may also need your chequebook. And while you wait for the engineer to turn up to reset the alarm maybe you should look round the rest of our website! I hope that after reading this you don’t get sleepless nights either from your alarm or your chequebook! HOW GOOD IS THE £99 MONITORED ALARM SYSTEM? Well my recent musings regarding a national security company’s £99 monitored home security systems being a bit useless have caused a bit of a stir so I thought it only right to look at it in a bit more detail. Throughout history we have used ever more imaginative methods to raise an alarm. They lit beacons when the Armada was spotted. They rang church bells when invasion was suspected. The air raid sirens wailed across London during the blitz. Then there was a whistle or bell designed to warn a bobby on the beat of a problem. The bobby and the bell was superseded by the siren which had flashing lights and strobes lights all designed to attract attention. Then it stopped there. Job done? No it wasn’t job done. Investing in a home security system is a major expense. It is an expense that we begrudge paying but for many it gives peace of mind. As technology improved domestic security systems which are monitored by an alarm receiving centre became more affordable but which type of monitoring are you paying for? As I wrote in my previous blog the purveyors of the £99 system are only offering key holder response. These key holders need to attend your property if your alarm goes off either in anger or by mistake, how they determine which it is I can’t be sure but they insist they filter out false alarms. See my previous blog re Billy the burglar. So when choosing your key holders you could nominate for Mrs Smith next door ( who is kind to your kids at Christmas, seems trustworthy and always keeps an eye on your property when you are away, but is 93 years of age) or do you go with Bob your brother in law (built like a brick outhouse and owns a couple of Rottweiler’s but lives twenty minutes away plus goes down the pub nearly every night and renders himself incapable of driving). Then there is always that rather dodgy looking bloke from number 26 (doesn’t appear to have a regular job but seems to be able to afford all of life’s little luxuries such as a 52” plasma TV, a fancy watch, a fancy mobile phone, a fancy sports car and 3 foreign holidays a year) It’s a difficult choice. I also note that £24.99 per month monitoring fee rises to £26.99 if you have a monitored smoke detector and to £27.99 if you have the cheek to ask for a monitored panic button. Before you make that commitment to spend your hard earned cash take a look at the Alarm Monitoring Company website. If your alarm goes off and we detect an intruder through our two way interactive monitoring system we challenge the burglar with a real human voice and not a “disorientating internal sounder” and more importantly we call the police and not Bob and his dogs down at the Dog and Duck and let’s just hope the intruder isn’t that dodgy bloke from number 26! FREE MONITORED ALARM SYSTEM FOR YOUR HOME. Has that headline caught your attention? Thought so. Last weekend in a demob happy Friday feeling mood one of our members of staff posted a picture on the internal email system. The aim of the email was to entertain yet offer a cautionary note to us all. As the poster of this email shared with us…..”The devil is in the detail”. Allow me to explain. The email contained a photograph which was of a traditional pub notice board, the type of which you quite often see outside a hostelry advertising food or upcoming sports events. Why was this one different? Because in big bold letters this sign proclaimed to anyone passing and reading it …FREE BEER. It is only on closer inspection that the full facts emerge. When you get near enough, to read it, the sign actually says…FREEwifi, great BEER. The devil is certainly in the detail! It is quite possible that you have arrived at our website via one of the popular search engines which are available on the interweb. Have you noticed that if you type in to your search engine the words monitored alarm system or home alarm system or intruder alarm systems in fact most configurations of those words you are usually greeted with a paid for advertisement from a well-known national security company offering a home security system for £99. Too good to be true? Let’s have a look at Beelzebub and his infernal details. Terms and conditions apply! A £99 installation fee and a minimum 36 month contract of monitoring and maintenance at £24.99 per month. 99 + (24.99 x 36) = 998.64. Monitoring costs cover key holder response only. They receive a signal to say that your alarm has activated but unless Billy burglar answers the telephone when they ring your premises they cannot tell whether it is a genuine alarm or not. So they ring you at work to tell you that your alarm has activated and it is possible that you are being robbed! £99 rising to nearly a thousand pounds for a rather ineffective Home Security System. Take a few minutes to browse through the Alarm Monitoring Company website. Look at how a proper monitored home security system should be. You will be pleasantly surprised. IS A DIY ALARM A SAFE OPTION? During your time off you may be tempted to make some improvements to your home. Our television schedules are currently being interrupted by a constant barrage of advertisements which encourage you to head off to your local DIY store to buy everything you need to completely transform your house. If you are one of the millions who will be tempted this weekend I would like to offer you a piece of advice. Walk straight past the DIY alarm section. Buy some wallpaper for your spare bedroom or some paint for the garden fence. Knock a wall down, create a water feature or build a pagoda. Do anything but do not buy an alarm to install yourself. You probably think this advice is offered because I would prefer you purchased a monitored burglar alarm from the Alarm Monitoring Company rather than saving money by doing it yourself. Far from it, these alarms are not very good. They operate at the very bottom of the technological ladder and are certainly not as all-encompassing as the packaging may suggest. Is anyone going to respond to your alarm when it triggers and the bell is ringing? Do you go for a “bells only” or do you get a fancy one that will send an alert to your mobile phone when you are away from your house? If it does send an alert to you are you going to believe it after a few false alarms? Who are you going to turn to when it doesn’t work or when it keeps false alarming at 2 o’clock in the morning? Will someone answer the premium rate telephone helpline when it will not switch off? How long will it be before you rip it out in frustration and then have to turn to the professionals? So enjoy your Easter break, stay safe and try not to eat too much chocolate. Get your alarm professionally fitted (our team will gladly give you a quote). You could save yourself an arm and a leg not only metaphorically but physically as well. This blog was inspired by my daughters friend who’s Uncle Dave (a plumber) is going to fit an alarm for her this weekend. What can anyone achieve in four minutes? Well in May 1954 Roger Bannister managed to run the first sub four minute mile, now sixty years later you can probably travel a hundred yards in four minutes at certain times of the day! This morning I prepared two farm eggs and soldiers within the required time scale, and very nice they were. Why the fascination with four minutes on a security website? Well in early March this year a hapless miscreant in the Denton area of Manchester managed to enter a bookmakers, commit armed robbery, flee with the money and be arrested by the police armed response unit all within the space of four minutes. Here is a précis of the actual alarm log from our files. 09:06:22 the panic button is pressed. 09:06: 39 the police are called. 09:09:24 the police armed response team arrive and very quickly arrest the perpetrator and recover the money. Hearty congratulations to all involved for their speed and professionalism. Now the felon has many “four minutes” to contemplate the error of his ways. Maybe a bit of music would help. May I suggest “O My God” by the band (who else) The Police! Can you guess how long it is? Money Supermarket have announced the top 20 UK postcodes where the most claims have been made to insurance companies due to burglary. The figures were collected from 3.1 million home insurance quotes made on moneysupermarket.com website during the last year, where previous claims for burglaries are required. Cholton in Manchester tops the list with the M21 postcode area having made 45.2 claims for burglary per 1000 people but London grabs attention with over half of the list being filled with London postcode areas. 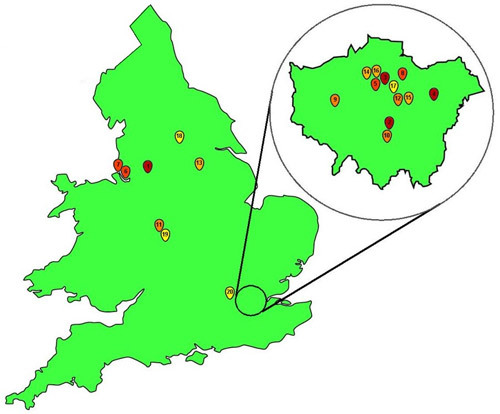 Do you live in one of these burglary hotspots? If so, it may be time to consider protecting your property with an AMCO Immediate Audio Response monitored alarm system. Our two-way audio communication gives you 24 hour protection, scaring off any potential burglars. For more details on all aspects of our monitored systems, visit www.alarm-monitoring.co.uk/about-monitored-alarms/, or alternatively, contact us on 0845 833 8823 to discuss your requirements with a member of our Technical Sales team, who can offer a quote for a monitoring system designed to your needs. Review of our systems - more wanted! Having such a different product from our competitors means that we're always trying to get our happy customers to advocate and talk about our great alarm systems. Unfortunately, not many people really talk about their alarm systems as they're not the most obvious / easiest thing to talk about. So, we're running a wee campaign at the moment to try to get as many of our customers writing / talking / sharing our systems with others. We've already had a few people talk / write about us. Here are a few examples: Alarm Monitoring Company review on a chat forum Alarm Monitoring Company reviews on a review site and, AMCO reviews on Google and finally, Video reviews of Alarm Monitoring Company alarms on YouTube We'd also appreciate any reviews on Twitter / Facebook too, so if you've got something awesome to say about AMCO please share it online!